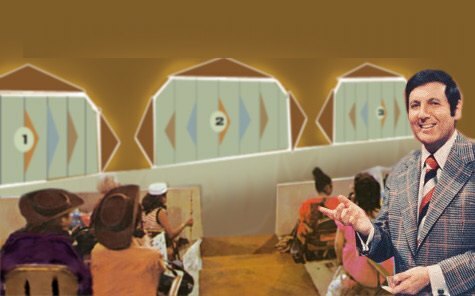 “Come on Down,” and see if, The Price is Right! Do you recognize these iconic lines and the two longest running game shows in television history? You don’t have to be a baby boomer to remember; both programs are still aired on television. The Price is Right originally aired in 1972, hosted by Bob Barker until 2007. Not long ago, TV Guide named it, “the greatest game show of all time.” The contestant who could most accurately estimate the price would win the merchandise being offered. I’m using the analogy of this game show as an introduction to this week’s article, but with a twist on the name of the show to: The Prize is Being Right. This is no small prize, especially if you’ve wondered about or wanted to know whether you can know the identity of the Antichrist. We were meant to know his identity, beginning with the 1st century Christians who expected Messiah Jesus would take them home to heaven at any moment (Rapture), and then the anti-Messiah to reappear soon thereafter. In all of Scripture, there are only two passages that challenge the reader to solve the mystery of the revelations underway. Both are in the book of Revelation and both apply directly to the identity of the Antichrist. “Wisdom is needed here. 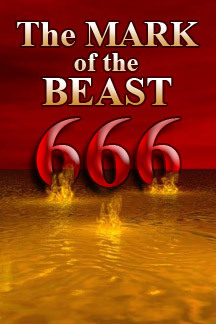 Let the one with understanding solve the meaning of the number of the beast, for it is the number of a man, His number is 666” (Revelation 13:18). “This calls for a mind with understanding: The seven heads of the beast … also represent seven kings” (Revelation 17:9). Let’s Make A Deal originally aired in 1963, conceived and hosted by Monty Hall. To begin the show something of value was offered to the contestants. They could either keep the prize or trade it for something unknown, which could be of higher value or of lower value (or virtually no value … a booby prize). There were three curtains or boxes from which to choose. Though I rarely watched either of these game shows, I do recall more than a little suspense created in the live audience and I assume the T.V. audience while the finalist was agonizing over which price to quote or which door to choose. In my book Out of the Abyss, I used this analogy of which door to choose in order to solve the dilemma that Bible scholars have debated for decades, if not centuries. Some 40-50 years ago, the discussion virtually ended as nearly all Bible commentators decided that the only solution was to make kingdoms out of kings in Revelation 17. The 7th kingdom would be a Revived Roman Empire. 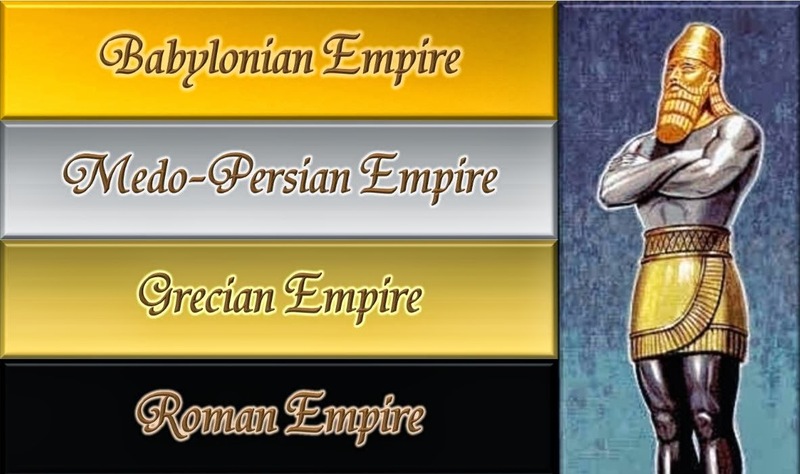 Recently, some students of prophecy have abandoned a Revived Roman Empire in favor of an Islamic Caliphate as the seventh kingdom and a Muslim Imam as the coming Antichrist. Can Scripture possibly be accurate by saying there are seven kings when historically there were more than seven Roman Emperors from the time of Julius Caesar to the time of Domitian whom they maintain was the Emperor when John the Apostle wrote Revelation? In last week’s Eye of Prophecy article, we covered in great detail the compelling evidence to show that another man named John was the author of Revelation. With, however, the clarifying condition that no matter which John wrote Revelation (or when), the seven heads of the Antichrist beast are still seven kings, not kingdoms. There are three historical doors (options) to choose from. Yet each one, when opened, will unmistakably show us that there are still seven kings behind each door. Consequently, Bible scholars can and should safely trade in their mistaken application of the seven kings as kingdoms for the prize of knowing that the Antichrist beast of Revelation is Nero, the man of lawlessness first exposed by the Apostle Paul. Of course, I’m not equating Nero to the prize itself. Rather the prize is the understanding that the mysteries of Revelation 13 & 17 were unveiled and the cryptic codes that partially concealed the Antichrist’s identity can be declassified. With a “mind of understanding” and “wisdom” we can know just as the believers of the first few centuries AD knew who Antichrist was (is, because he will return from the Abyss). 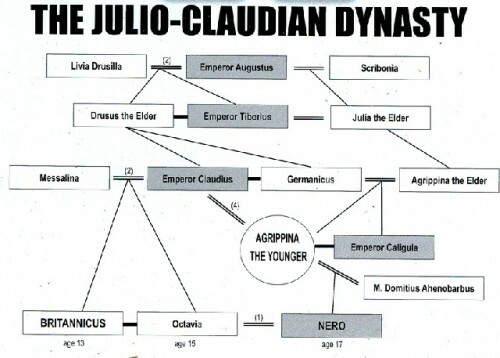 Today we’ll examine more evidence to demonstrate that the sequence of Roman emperors in the first century credibly allows for seven of them to be the seven kings of Revelation 13 and 17; five of them had already died before John saw the beast of Revelation and one of the five was Nero. “Why are you so amazed? the angel asked. I will tell you the mystery of this woman and of the beast with seven heads and ten horns on which she sits. The beast you saw was once alive but isn’t now. And yet he will soon (abruptly, at any moment) come up out of the bottomless pit and go to eternal destruction. And the people who belong to this world (those left behind at the Rapture) … will be amazed at the reappearance of this beast who had died” (Revelation 17:7-8, parenthesis mine). If Revelation 17 as a whole or these verses just quoted in particular were the only references to Antichrist in the Bible, it would be sufficient to validate that the Antichrist beast was a first century man who would reappear from the Abyss at the outset of the Tribulation. This passage stunningly seized my attention in November, 2008 and completely changed my previous view (the same view still held by Bible scholars) that the identity of Antichrist couldn’t be known until after the Rapture. This disclosure propelled me on an unforgettable voyage to the ancient Roman world, to the very origin and lair of the beast, to the Abyss and back again, to the pre-emptive death of the man of lawlessness, and then reappearance of this evil tyrant as the Antichrist beast. 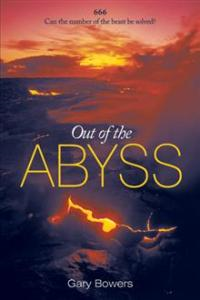 As a result, Out of the Abyss was published in February, 2011. “This calls for a mind with understanding. The seven heads of the beast represent the seven hills where the woman rules. They also represent seven kings. Five kings have already fallen, the sixth now reigns, and the seventh is yet to come, but his reign will be brief” (Revelation 17:9-10). As indicated in the About page on the Eye of Prophecy website, all of my Scripture quotes are taken from the New Living Translation, unless indicated otherwise. “The beast which was and is not, is himself also an eighth and is one of the seven, and he goes to destruction” (Revelation 17:11). Notice that the verse says the beast is “also” an eighth. Also is emphasizing that the beast, besides being one of (from) the seven kings, is the composite beast himself. It’s not saying that the Antichrist (beast) is an additional king, who when added to the seven kings makes a total of eight (different) kings; because the rest of the passage unquestionably states there are only seven kings. Thus the beast is one of the seven but will (future tense when he returns) also be an eighth king because he will resume his reign as one of the seven when he reappears from the Abyss. Please understand: The composite beast as a whole is a man, the Antichrist (Nero), because the beast is referred to by the personal pronoun “him” in Revelation Chapter 17 and “he” in Chapter 13. Before we open the three doors that will all lead to the same room full of seven Roman Emperors, let’s examine two more significant reasons why the seven heads of the Antichrist beast are kings (Roman emperors) not seven kingdoms, which students of prophecy identity as: Assyria, Egypt, Babylon, Persia, Greece, Rome, and a so-called Revived Roman Empire. 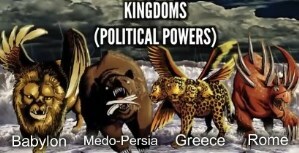 Seven kingdoms are in direct contradiction to two prophetic passages in Daniel (Chapters 2 & 7) that incontrovertibly tell us there would be only four World Empires—Babylon, Persia, Greece, and Rome—in the prophetic context of how these kingdoms interacted with God’s plan for Israel, including the Messiah. Of paramount importance is that the seven heads of the beast—explained by the angel as seven kings—are referenced by the singular personal pronoun of “his” (the seventh king, Revelation 17:10). Then, the ten horns (ten kings of the Tribulation period) also are referred to by a personal (plural) pronoun … they. “The ten horns of the beast are ten kings who have not yet risen to power. They will be appointed to their kingdoms for one brief moment to reign with the beast. They will agree to give him their power and authority. Together they will go to war against the Lamb, but the Lamb will defeat them because he is the Lord of all lords and King of all kings…” (Revelation 17:12-14). Although the seven (heads) kings were 1st century Roman emperors and the ten (horns) kings to come will be rulers of ten nations during the Tribulation period, all of them are kings, not kingdoms. Grammatically and contextually, there’s no way to circumvent these pronouns. These masculine personal pronouns cannot and would not (certainly not in Scripture) be used in place of kingdoms. Sometimes in English, we use the personal plural pronoun “they” as a substitutional reference to places or things, but it is not an accurate use of the word. For example, if we first identify the seven kingdoms by name (Babylon, Persia …) then refer to them in the plural, we might say or write, “They.” However, if we do, the personal plural pronoun is specifically identifying the people of those kingdoms. For kingdoms, the accurate grammatical term would be the adjective “These (plural of this) … kingdoms. Or just, “these.” Or “those” (plural of that) … kingdoms. Bottom line: personal pronouns used in place of the noun kings in the Biblical text could stand alone as a reason not to substitute kings with kingdoms. Yet, there is another substantial reason why kings must be kings and kingdoms must be kingdoms. It’s logical that a kingdom should have a king (or queen) and a king should have a kingdom, but throughout history kings have been without kingdoms and kingdoms have been at one time or another without kings. Not only grammatically, but also experientially, kings do not equate with kingdoms and the two words should not be used interchangeably at whim, or at all. The same goes for the Greek language in which the New Testament was written. The Greek word for kings is basileus: defined as leader of the people, prince, commander, lord of the land, king. This is the word used in Revelation 17:9: “…they also represent seven kings.” And it’s the same word used each time in this Revelation passage translated “kings.” It is also the Greek term used numerous times throughout the New Testament, translated king or kings. Just like the English word for king and kingdom are similar in spelling and pronunciation but quite different in their meaning and application, so is the Greek word for kingdoms, which is: basileia. The meaning: a territory or dominion or base of royal power, subject to the rule of a king or queen or prince or whatever. However, the Greek word for kingdom is a feminine noun, which also makes sense. Although there are rare exceptions, nearly all nations (kingdoms) are referred to by the feminine pronoun when substituted for the name of the country. America is the land of the free and the home of the brave. 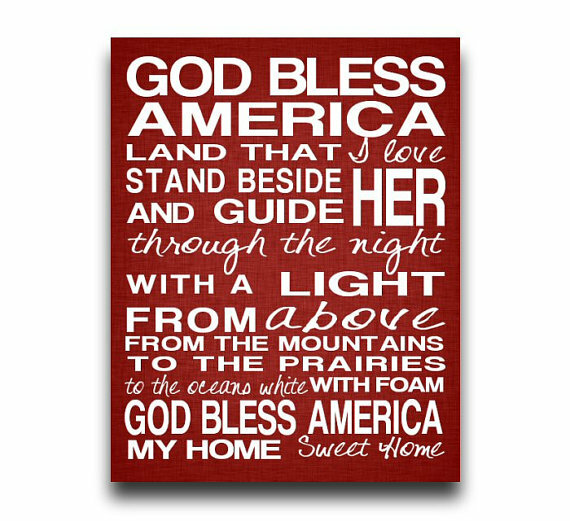 Or, she is the land of the free… I love America. Or, I love her (which would be expressed even by a woman using the personal pronoun). The very fact that the author John employs both Greek words for kings and kingdoms in Revelation 17 makes for an unambiguous grammatical distinction between the two. “The ten horns of the beast are ten kings who have not yet risen to power. They will be appointed to their kingdoms for one brief moment to reign with the beast” (Revelation 17:12, italics for emphasis). All scholars agree that the ten horns are just what the text states … basileus or ten kings. Although the same word for kings is employed for the seven heads in verse 9, they substitute kings with kingdoms. At the very minimum that seems to be inconsistent. At the maximum, it’s simply not grammatically accurate. …the fact is that the Greek words used for king(s) and kingdom(s) are precise definitive words that delineate and distinguish between the two. Both Greek words are utilized in the same revelation scene given to John; hence, it’s even more imperative that there is no confusion generated by liberally substituting the actual Greek word for kings with a kingdom interpretation. I believe this would be a violation of the textual and contextual language and meaning. Please understand, it must be one or the other; it can’t be both king and kingdom. The rest of Scripture that deals with the Antichrist hinges on the proper application of kings to the word kings versus kingdoms. To a great extent, one could make a strong case that the Greek words alone would decide the issue here. It is a case that probably would stand the test of any formal debate, in any etymological or linguistic court, as it were. Footnote: The application of kingdoms to the Greek word for kings is not entirely new to modern prophetic study, although the magnitude of this application became much more evident shortly after the resurgence of prophetic studies in the 20th century. (Pages 124-125). Is It Door Number One, Two, Three or All Three? Before we can make a deal (agreement) that there are, with historical 20/20 hindsight, three doors (options) that can and will lead to seven Roman Emperors to precisely match what John is telling the first century believers and all believers thereafter, let me repeat why this is necessary. We need to fully comprehend that the Antichrist will not be a modern-day born man—as clearly controverted by Revelation 17:7-8, which states the Antichrist had already lived and died BEFORE John even wrote Revelation, and that his identity can be known (Nero). Therefore, there will be a Revived Roman Emperor (an eighth but also one of the seven) not a Revived Roman Empire as the seventh kingdom … when, in fact, those seven are kings not kingdoms. Even though there were more than seven Roman emperors in the first century, there were only seven of these emperors who match and, therefore, confirm the seven kings of Revelation. The following is a list of Caesars in the first century. Beginning with the first Caesar whose reign actually started in the 1st century BC. … before the birth of Messiah Jesus. Later, you’ll see why I’ve lumped three emperors together and why the emperor after Domitian is listed. The vast majority of Bible commentators believe the author of Revelation is John the Apostle, written during the reign of Domitian. Thus, the total number of “kings” would be twelve, not seven. Thirteen, if Julius Caesar is included—who many students of prophecy have (erroneously) classified as a (the first) Caesar. Hence, the substitution of kingdoms for kings. Time and space in today’s article does not permit detailed elaboration, so I will simply relay the position of most historians who contend that Julius was not actually one (the first) of the Caesars, even though his name is linked to the title of Caesar. Some members of the Roman Senate murdered him before he could proclaim himself as Caesar and/or before he could be acknowledged as the first Roman dictator. In fact, history strongly indicates that Julius, himself, was undecided whether to proclaim himself as Caesar when he went to the Senate on that fateful day. When you examine virtually any historical account, you will find the first Emperor listed as Augustus who was recognized by the Senate and affirmed by the Roman citizenry as the first Roman Caesar, nearly two decades after Julius was assassinated. So Who Were the Seven Kings (Emperors) and Which Door Is Each Set of Seven Behind? *Note: Doors number one and two are for those who believe that another believer named John wrote Revelation, not John the Apostle. Door number three is for those who adamantly contend that the Apostle John authored Revelation and did so during the reign of Domitian. But what you are about to discover is that it doesn’t matter which door you open; they all lead to the convincing conclusion that there were, indeed, seven 1st century Roman Emperors to match the seven kings as stated in Revelation. Thereby, historically confirming the amazing accuracy of Scripture and the fallacy of switching seven kings to kingdoms. First, a review regarding the status of the seven kings as relayed by John, at the very time he received these revelations on the isle of Patmos: “Five kings have already fallen, the sixth now reigns, and the seventh is yet to come, but his reign will be brief” (Revelation 17:10). We’ll scrutinize the term fallen in more detail; for now sufficient to know that, in its broadest application, it simply means, died. Five of the seven kings had already lived and died (INCLUDING THE ANTICHRIST HIMSELF … as stated three times in Revelation 17 and three times in Revelation 13). Some scholars who believe that another man named John wrote Revelation place the time of authorship shortly after Nero’s death, during the brief tenure of Galba between June, 68 AD and January, 69 AD. Accordingly, the five Caesars who had already died were: Augustus, Tiberius, Caligula, Claudius, and Nero. Galba would be the sixth king who “now reigns” with the seventh king to follow but “his reign will be brief.” Sure enough, Otho succeeded Galba and lasted as Emperor for a whopping three months. Now that is a short reign! So, the first door easily opens to a room of the first seven Roman Caesars (kings) to perfectly match what the angel is telling John the Revelator. Yet we must begin with Augustus, not Julius, which is historically accurate because Julius was never a Caesar in the first place. Although they are few compared to students of prophecy who ascribe authorship of Revelation to the Apostle John, the majority of Bible scholars who believe another John wrote Revelation believe the preponderance of evidence shows that Revelation was written during the reign of Vespasian, 69-79 AD. Nevertheless, this door will also lead to a room occupied by seven Roman emperors! If Vespasian was the sixth king reigning when John received the revelations, then his son, Titus, would be the seventh. By referring again to the list of Roman Emperors, we see that Titus was only Caesar for two years (79 – 81 AD). In contrast to Vespasian and the first five Caesars, the reign of Titus would certainly qualify as brief. Ah, but Vespasian and Titus could be numbers six and seven. And were, in fact, if door number two is the historical explanation for the seven kings. Reminder: all three doors lead to seven kings. The only difference in the three doors that lead to the same room of seven Caesars is which seven are they. Moreover, there will be no cheating in order to make Door Number Two a viable option to explain the succession of emperors when Revelation was written! Here’s why and how. *Note: A pause here to explain that if even one of these three historical options couldn’t fit with seven Roman emperors, then I wouldn’t have allowed my book Out of the Abyss to be published. In fact, I wouldn’t have even continued writing the book. Nor would many of the articles in Eye of Prophecy (category of Antichrist) have been subsequently written to further affirm that Nero is the Antichrist. Because the vast majority of historians have done exactly that. 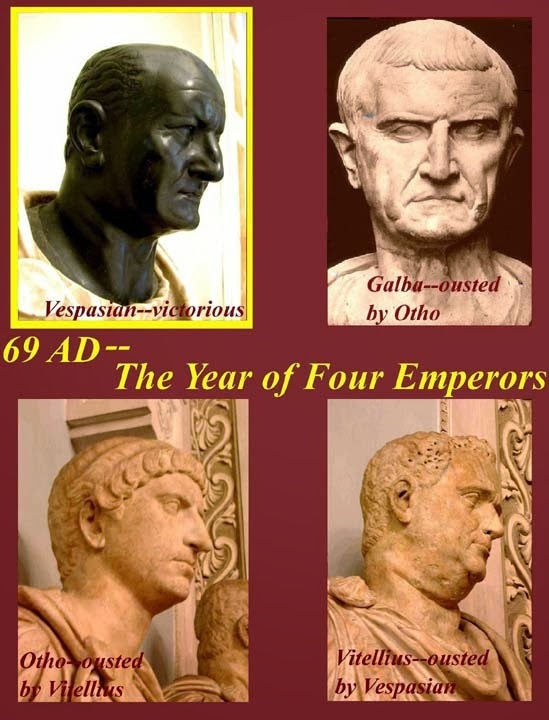 They have catalogued these three emperors as illegitimate usurpers to the Roman throne after Nero’s death, during an 18 month time of civil war upheaval in the Roman Empire. Please refer to, Out of the Abyss (Chapter 17) for a more detailed explanation, as time/space doesn’t permit in today’s article. The longest “reign” of these three pseudo pretenders to the throne was Vitellius … for only nine months. A modern-day comparison would be if the President of the United States died in office, the legal and proper succession would flow to Vice President. But let’s say that the Speaker of the House, or a senator, or perhaps a three-star general decided to be President. Likely, there soon would be civil war; at the very least disorder and unrest would be rampant throughout the country. No matter how long anyone stayed in office, few would ever consider them to be the legitimate President of the United States. Likewise, neither the Romans as a whole nor history acknowledged these three men as bona fide emperors. And, neither did the angelic messenger of Revelation 17, if he gave the visions to John of Patmos during Vespasian’s reign (Page 152). In order to fully grasp that both of these first two doors are viable options (explanations) we need to place ourselves in the 1st century alongside of the believers who were reading Revelation for the first time. 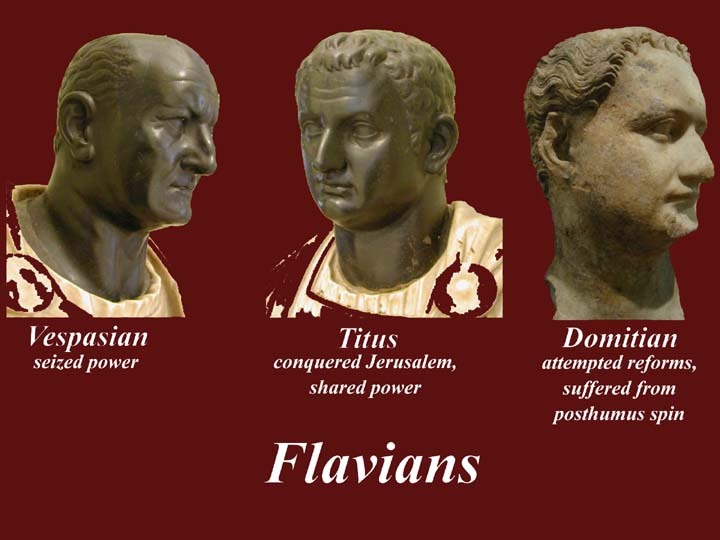 Most Christians would have been fully aware of the exact sequence of Roman emperors, including whether or not Galba and Otho would be the sixth and seventh kings (Door One); or whether those two and Vitellius would be disqualified and Vespasian would then be the sixth king and his son, Titus, the seventh. They would most certainly have known which emperor was the “sixth (who) now reigns” and the seventh in the event some believers didn’t read Revelation until the seventh Caesar began his reign, or any time thereafter. This premise will also apply to Door Number Three. If, in fact, John the Apostle wrote Revelation and did so during Domitian’s reign, then a third door is necessary as an (accurate) alternative to accommodate seven Roman Emperors. Once again, as presented in last week’s article, we still do not know for sure which John authored Revelation. Yet, it was necessary to show—which was done through much evidence and analysis of that evidence—that another believer named John could certainly have been the author. If Revelation was written during Domitian’s tenure as Emperor, then he would be the sixth king and Nerva, his successor, the seventh. We see that Nerva was on the throne for only two years so that would definitely qualify as a brief reign. The biggest hurdle for scholars who maintain Revelation was written during Domitian’s reign is the verse declaring that five kings had already “fallen.” At face value that is a huge problem; by the time you get to Domitian, the previous ten Emperors had already died … seven if you eliminate Galba, Otho, and Vitellius. Either way it’s more than five. During my extensive study, research, and writing of Out of the Abyss, this was also my biggest prophetic puzzle to solve … one of the toughest pieces to refit, or so I thought. However, the last thing I would or could do was to force this door open with mere supposition or some flimsy hypothesis for the sake of trying to prove my premise that Nero was the first century man of lawlessness (Antichrist) and will return as the 21st century beast (the same Antichrist). In order to successfully enter this door without forcing it open, I needed to more closely examine the Greek word for “fallen.” Obviously it means death (died), but could it have a more specific meaning? The answer: Yes, could and does! First, we need to scrutinize the Greek word translated “fallen” in Revelation 17:10. The Greek word is pipto. In the broadest sense it means to perish, to come to an end, to cease. But it also conveys a more specific meaning; that of being thrust down, to be removed from power by death at the hand of another. In the immediate context of Revelation 17:10, the angel could certainly have been referring to five kings who had been killed (removed or toppled from power) by someone else, as opposed to a natural death. …If, in fact, the angel used the Greek word pipto (fallen) in the more contracted but nevertheless equal meaning of the word, then we should discover five Roman emperors who were assassinated, murdered, or killed by someone else (Page 153). History shows us that four of the ten Roman Emperors from Augustus through Titus died of natural causes … Augustus, Tiberius, Vespasian, and Titus. Otho committed suicide which doesn’t qualify as being killed (eliminated) by someone else. That leaves five emperors. To successfully open door number three, we’re going to allow Galba, Otho, and Vitellius back into the equation. Why? Because Scripture could certainly have included these three. As said in Out of the Abyss: “This is not an arbitrary manipulation of history; rather, we have a feasible application of more than one option with respect to the angel’s sequential choice of the seven emperors. Conversely, if even one of these doors doesn’t open, then the foundational options collapse and I suppose we return to kingdoms instead of kings—despite the Greek word for kings and the deference to personal pronouns” (Pages 153-154). Caligula: Assassinated by the Praetorian Guard. Claudius: Murdered by his wife, Agrippina (with assistance or at least collusion of Nero). Nero: Killed by his servant. Some accounts indicate he committed suicide, but suicide was only his idea. History clearly shows he couldn’t go through with killing himself so his servant, Epaphroditos, ended up striking the fatal blows. Galba: Murdered in favor of Otho assuming the throne. Vitellius: Assassinated by Roman soldiers. If Revelation was given to John the Revelator during Galba’s tenure, then (the first) five kings had already died …by using the broader application of pipto (fallen). With the seventh king to come (Otho) having a very brief reign. Result: A perfect fit for the seven kings. If John of Patmos or even John the Apostle received the revelations during Vespasian’s reign, the same five emperors had died (Augustus through Nero); however we—as historians have done—can exclude Galba, Otho, and Vitellius Why? Because they were temporary fill-in rulers generated by chaos in the Roman Empire after Nero’s death. Result: A very nice fit. If the book of Revelation was written by John the Apostle during Domitian’s reign, we simply apply the Greek word pipto (fallen) in its more restricted usage … meaning forcible removal from power at the hands of another. But also to include the three quasi-emperors specifically in the context of how they died. Result: An equally fine fit. The book of Revelation was not written exclusively for … whatever generation would be on earth when the end times arrived. In hindsight, we in this generation look back and subconsciously, even unintentionally or subliminally think that the Book of Revelation is applicable only to our age. But that is rear-view vision only, simply because Christ hasn’t yet returned. Obviously, the unfolding prophecies of Revelation will be applicable to the generation alive at that time; however, Revelation was first and foremost written to and for the 1st century believers as much as 2nd century, 5th century, 10th century, and so on. That is why Jesus told John, “Write down what you have seen—both the things that are now happening and the things that will happen” (Revelation 1:19). Essentially, all but two things are future when it comes to end times prophecies culminating with the Day of the Lord, whether the future was the 1st century or the 21st century. Those two exceptions are men: the Messiah and his antithesis, Antichrist. Since Jesus could have returned in the first century, then there must also have been a first century man who would immediately precede Christ’s return! That is exactly what Revelation Chapter 17 is telling us (Page 155). Adding to this excerpt, we can even better understand that a first-century Antichrist was necessary by realizing that this same man (Nero) has been confined to the Abyss and will reappear shortly after the Rapture. This sure prophecy could have taken place anytime since the first century to this very day. Although all three doors are legitimate scriptural and historical options, which one would you choose? Whichever door you open you will have traded up for the prize of being right! And that’s a pretty good deal! The price will seem right to those left behind when they choose Antichrist and refuse to trade up for the True Messiah, Jesus. But it will be a horribly heavy price to pay and there will be no turning back once they accept the mark or name of Nero in their right hand or forehead (Revelation 13:16-18). They will have literally made a deal with Satan when they take the mark of the beast, and they will have sealed their eternal destiny (Revelation 14:9-10). But for those who will not be amazed at the reappearance of a 2,000 year-old Roman Caesar because Scripture had predicted this long ago, they will choose (even on pain of torture or death) the true Messiah, Jesus. And their reward will be very great. “…They had not worshipped the beast or his statue, nor accepted his mark on their forehead or their hands. They all came to life again, and they reigned with Christ for a thousand years” (Revelation 20:4b). “Blessed and holy are those who share in the first resurrection. For them the second death holds no power, but they will be priests of God and of Christ and will reign with him a thousand years” (Revelation 20:6). “He will wipe every tear from their eyes, and there will be no more death or sorrow or crying or pain. All these things are gone forever” (Revelation 21:4).